Our almost kind of weekly review of Dark Horse Presents tackles volumes 21, 22, and 23! 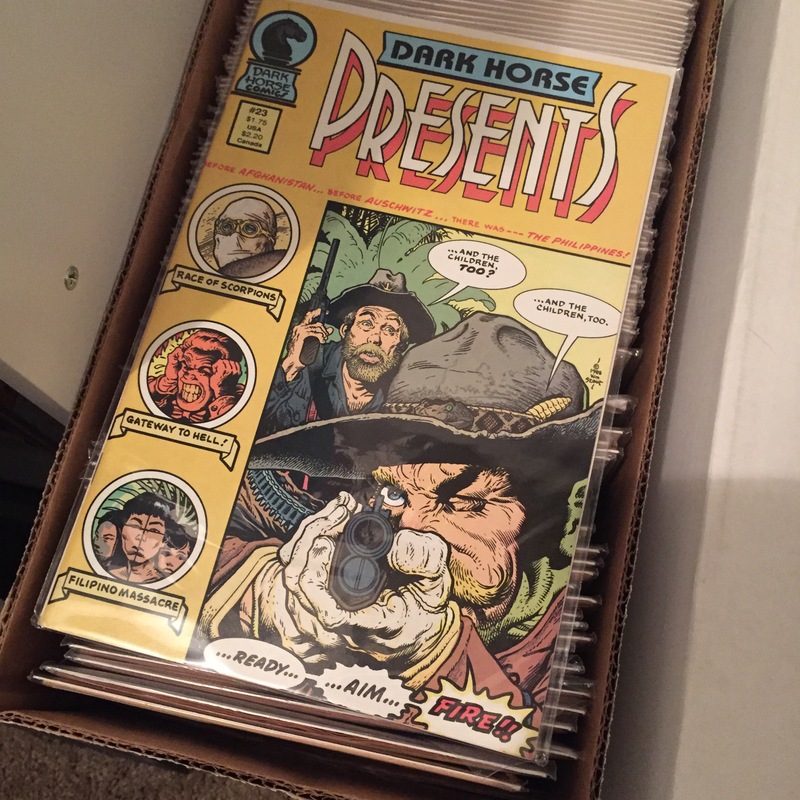 For those who might not be familiar with DHP it was one of the greatest comic book anthologies ever made and was the flagship title of Dark Horse Comics! I’m reading through it one week at a time and sharing my thoughts on these awesome comic books from the 80’s and 90’s! I decided to cover a few issues in this post to see if I enjoy covering more than one issue a week. Onto to the comic books! 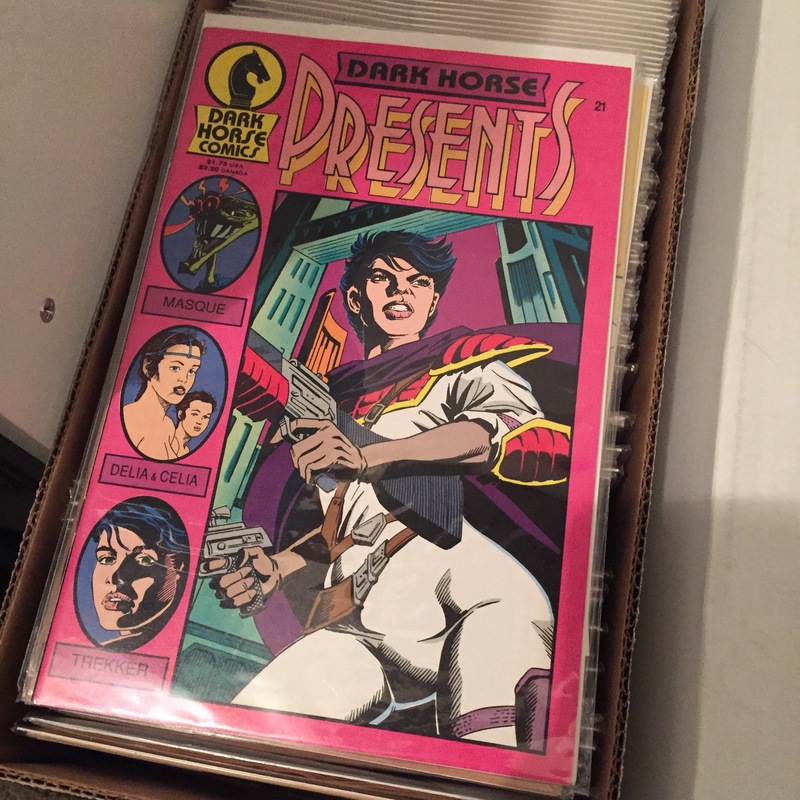 Dark Horse Presents issue 21 features the last installment of Masque by Mark Badger and I feel like singing “Ding-Dong the witch is dead….” because this story is not for me. Honestly it almost sank my wanting to read DHP itself! Glad that confusing and odd story is done. Delia & Celia by Gary Davis is the prehistoric tale of two young women fleeing for their lives and encountering adventure in a strange and wonderous world. Davis has the ability to create ancient civilizations with apparent ease and spin entertaining tales. Trekker by Ron Randall is always interesting and this episode brings a story arc to a close with a difficult ending. After facing life and death our hero is forced to look inward for answers to some difficult questions. 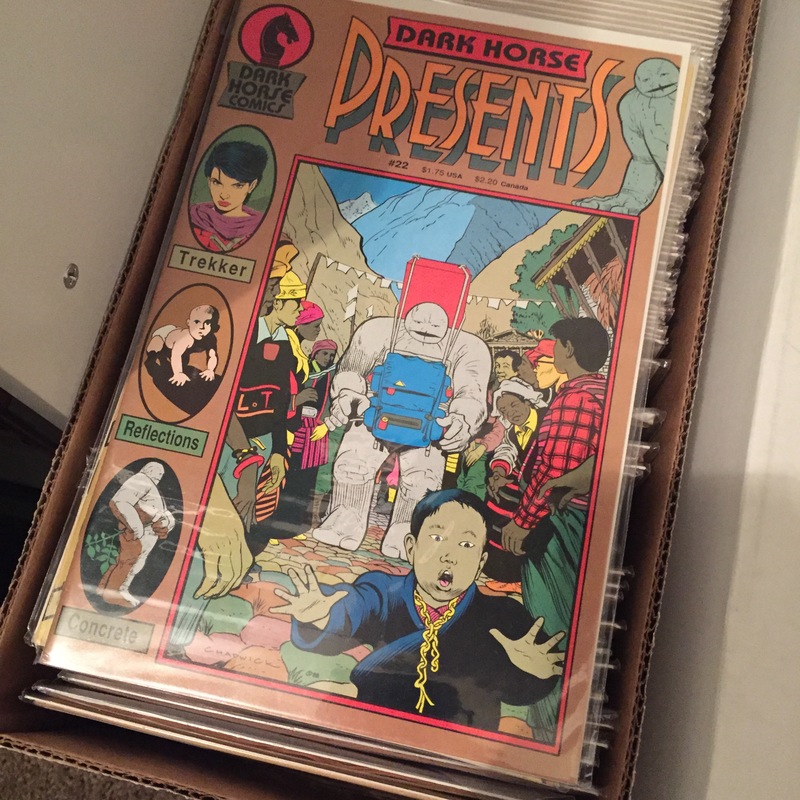 Dark Horse Presents issue 22 features the ever incredible Paul Chadwick’s Concrete which won the 1987 Harvey Awards for Best New Series and Best Cartoonist! Concrete always offers a glimpse into the heart of humanity and in this issue we see a little bit of the wonder of the mind of a child. Another beautiful tale told well. Reflections by Andrew Murphy is a SciFi tale on the difficult morality of cloning and a peek into how that might play out in the real world. This one was very thoughtful and thought provoking and had implications that reached beyond the surface. Trekker by Ron Randall featured finishing art by Dave Dorman who is a personal favorite artist of mine! This issue is a segueway issue that shows that comic book stories can be thoughtful and take time to develop. Good character building. This issue featured two quick bonuses: Duckman by Everett Peck is a funny look at the stressful world of business and Police Beat by Rick Geary is an offbeat look at some of the odd calls police in the rural Midwest deal with. Dark Horse Presents issue 23 starts off with a bang. Filipino Massacre by William Stout reminds everyone that the history you were taught is only ever a part of the full story. Gateway To Hell by John Arcudi and Gary Barker shows a little of the difficult nature of PTSD but in truth felt more like a focus on a monster than a thoughtful addressing of a topic worthy of discussion. Maybe they were trying to raise awareness but this seemed an ill considered method. Police Beat by Rick Geary leaves you shaking you head, chuckling at, and worrying for humanity. Finally! One of the reasons I love DHP: Race Of Scorpions by Leopoldo Durañona is simply incredible. Breathtakingly detailed artwork and thoughtful story combine in this SciFi look at a post climate apocalypse earth. In this future water has become scarce and the commodity we live off of. It is an intriguing and engaging story that tackles multiple topics with each installment! I’m excited to have reached the start of it! This entry was posted in Book Reviews, Dark Horse Presents and tagged comicbooks, DarkHorseComics, DarkHorsePresents on October 24, 2016 by redstarreviews.